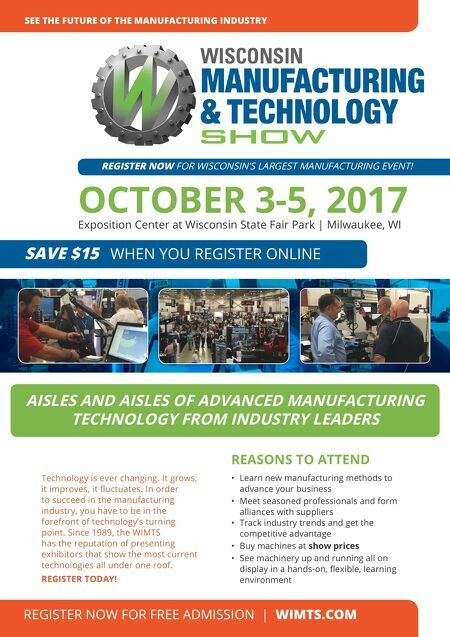 142 MMS September 2017 mmsonline.com SYSTEMS AND SOFTWARE • Production Milling • 4/5 Axis Milling • Production Turning • Multi-Axis Mill/Turn Vero Software is the market leading provider of computer aided manufacturing (CAM) systems for NC part programming. Our CAM systems for milling, turning, mill-turn machining and Wire EDM offer unparalleled ease of use and sophisticated toolpath generation. www.verosoftware.com THE WORLD'S #1 CAM SOFTWARE COMPANY Get your Vero software Test Drive Go to www.verosoftware.com/testdrive emulation technology. 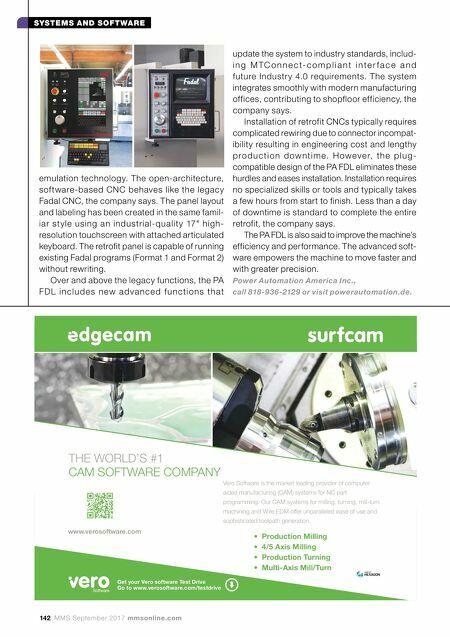 The open-architecture, sof tware-based CNC behaves like the legacy Fadal CNC, the company says. The panel layout and labeling has been created in the same famil- iar st yle using an industrial-qualit y 17" high- resolution touchscreen with attached articulated keyboard. The retrofit panel is capable of running existing Fadal programs (Format 1 and Format 2) without rewriting. Over and above the legacy functions, the PA F D L i n c l u d e s n e w a d va n c e d f u n c ti o n s th a t update the system to industry standards, includ- i n g M T C o n n e c t- c o m p l i a n t i n t e r f a c e a n d future Industr y 4.0 requirements. The system integrates smoothly with modern manufacturing offices, contributing to shopfloor efficiency, the company says. Installation of retrofit CNCs typically requires complicated rewiring due to connector incompat- ibility resulting in engineering cost and lengthy p r o d u c t i o n d o w n t i m e. H o w e v e r, t h e p l u g - compatible design of the PA FDL eliminates these hurdles and eases installation. Installation requires no specialized skills or tools and typically takes a few hours from start to finish. Less than a day of downtime is standard to complete the entire retrofit, the company says. The PA FDL is also said to improve the machine's efficiency and performance. The advanced soft- ware empowers the machine to move faster and with greater precision. Power Automation America Inc., call 818-936-2129 or visit powerautomation.de.